There are many similarities and many differences between wakeboarding and waterskiing. Let us take a look at some of them. – Both are water sports. This is a no-brainer! – Both involve an individual attached to a motor boat by a cable or a rope and being pulled by the same. – Both involve surfing the water with smooth objects fitted to the feet of the individual. – Both are glamorous sports where emphasis is not just on surfing the water but on performing tricks as well. In fact, tricks form the heart and soul of the sport. Whether an individual is an expert in wakeboarding or waterskiing is dependent on the skills and tricks that he or she is capable of performing. – Both are inclusive sports where intense competition does not prevent individuals from helping each other out in the various aspects of the sport. On the other hand, there are a lot of differences between the two sports. The first and most obvious distinction is that the wakeboarding is a variant of waterskiing. The latter has been around for more than 80 years today while the former is a comparatively very recent phenomenon. Wakeboarding is a combination of water skiing, snowboarding and surfing. The sport has borrowed the concept of being pulled by a motor boat powered by a cable from water skiing. It has borrowed the concept of using a board instead of skis from snowboarding. It has borrowed the whole idea of creating a wake from the motor boat to surf the same from surfing. It is a mish mash sport that has been created by the combination of innovative ideas and improvements in technology. The presence of long and unwieldy skis makes it very difficult to perform different types of stunts in this sport. Instead, the individual is restricted to a limited number of stunts. On the other hand, wakeboarding offers a lot more scope. The difference is as vast as the difference between snow skiing and snowboarding. 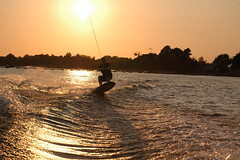 The popularity of wakeboarding has contributed a lot to the popularity of water sports. It is enhanced its appeal amongst the youth. The creation of the wake by a motor boat has had a huge impact on the popularity of the sport. This has made it possible for even those who do not live on the coast to enjoy water sports. All one has to do is get a motorboat that is powerful enough to create a big wake and one shall have a wave right in the middle of the lake. All one has to do is ride the wake and perform tricks and stunts when riding the turbulence. 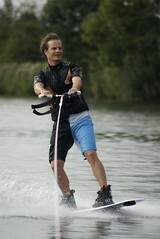 The sport of wakeboarding is performed on a board which is very different as compared to the skis. Further, there is just a single board and not two units as is the case in water skiing. 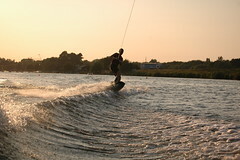 The sport of wakeboarding has led to its own variants like wake surfing and wake skating. Go to Wakeboard Zone to get your free ebook about Wakeboarding at Wakeboard . Wakeboard Zone also has information on Waterskiing Waterskiing and a Wakeboarding Forum where you can connect with others who love Wakeboarding. You can Find your free Ebook on Wakeboarding at http://www.wakeboardzone.org/. One of the top manufacturers of wakeboards, the Hyperlite team consists of top, current and ex – professional tours including Scott Byerly, Shaun Murray, JD Webb and Erik Ruck. Needless to say, Hyperlite Wakeboards offered to the public are great quality boards that are preferred by experts and novices alike. The Kids and the Girls series make Hyperlite different as compared to all other manufacturers. Very few manufacturers take the effort to provide wakeboards specially designed for females. Kids are offered separate wakeboards due to the height and weight factor. However, no manufacturer offers such quality wakeboards with so many features designed specifically to help kids learn wakeboarding. The Motive wakeboard offered in the Kids Unite Series is very affordable and is designed solely to enable kids to learn wakeboarding. This board is perfect for children who are participating in wakeboarding for the first time. State 125 takes the participant to the next level with a three stage rocker. This board is perfect for those who have tried wakeboarding and have liked the same. This board is best for those who want to become proficient at wakeboarding and those who want to learn more tricks. The appearance, patterns and colors used to paint the wakeboard play a major role in its ‘coolness’ quotient. Male wakeboarding enthusiasts often express themselves through loud colors and brash designs. However, the same is not true for women. They love those boards that help them connect with their feminine side in a predominantly male sport. That is the reason why Hyperlite wakeboards designed specifically for women come in bright vibrant colors like pink combined with white or black. These boards contain simple and minimalist patterns that look great when the individual is performing wakeboarding stunts. Women centric wakeboards are available for beginners, intermediate stage participants and experts. The basic board is perfect for those who are participating in wakeboarding for the first time. The intermediate boards introduces the female participant to three stage rockers and is designed to accommodate the balancing errors that often take place when the individual performs tricks and stunts for the first time. Hyperlite wakeboards for women experts are no different from those for male experts as far as quality and design of the boards are concerned. The boards for experts include molded fins, cupped rails and thinner profile. All this enables the wakeboarding enthusiast to participate and compete with the best without having to worry about the wakeboard. You can opt for the standard Hyperlite wakeboards for beginners and experts if you are not keen on feminine designs. All Hyperlite wakeboards are great quality boards designed to last for a long time and provide great value for money. Go to Wakeboard Zone to get your free ebook about Wakeboarding at Wakeboard . Wakeboard Zone also has information on Hyperlite Wakeboards, Hyperlite Wakeboards and a Wakeboarding Forum where you can connect with others who love Wakeboarding. You can Find your free Ebook on Wakeboarding at http://www.wakeboardzone.org/. The evolution of wakeboards, wakeboarding tricks, wakeboarding wetsuits and the environments tackled by wakeboarders has been a remarkably rapid process. It was not so long ago that someone first thought to attach foot straps to a surfboard and tow the whole setup behind a motorized vehicle. It was only the early 1980’s that this moment occurred, and wakeboarding has been on an upward trajectory of progress and innovation ever since. Now wakeboarding is recognized as a sport unto itself, with its own particular equipment, tricks, and styles. Here are some of the key innovations that illustrate the rapid rise of wakeboarding into the unique sport it is today. The legends of early wakeboarding say that the first boards were towed by a truck driving along the shoreline of the ocean. Since then, wakeboarding has expanded to more locations than its originators could have imagined. 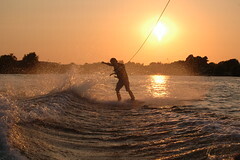 Wakeboarding is commonly done in lakes, where the riders can be towed by a rowboat or jetski. Increasingly common are closed cable parks, in which vehicles with tow ropes are replaced by electrically powered motors suspended above the course. Oftentimes, these settings are equipped with other obstacles that the rider can use to perform tricks. What results is an range of tricks and maneuvers reminiscent of skateboarding. For example, a wakeboarding-friendly lake might feature launch ramps, ledges and rails, and some cable parks might even contain drops and gaps for wakeboarders to jump over. Taking this approach to tackling obstacles even further, some wakeboarders will look for obstacles on the shores beside rivers or canals, or even areas or waterways next to dams and drainage tunnels. In these shallower waters, the riders are more likely to be towed by a jetski rather than a boat. A similarity between wakeboarding and other board sports is that some of the most technical and impressive tricks are those that involve a high number of rotations. From the fist time someone did a 180 and started riding switch stance and/or fakie (traveling backwards), riders of wakeboards, skateboards, snowboards, and surfboards have been pushing to limit toward spinning in ever greater circles. Each time someone lands a trick with an additional 180 degrees past the previous maximum, the expectations of what is possible have been exploded. In wakeboarding, this moment happened in 2008, when Danny Harf landed the first 1260 – that’s three and a half rotations, with the added difficulty of having to pass the tow rope behind the back after each spin. Granted, it is risky to compare rotations between board sports – bodies clad in wake wetsuits have different levels of agility, and landing just a 360 in street skating is still considered a fairly advanced trick, while skiers and snowboarders have gone as high as 1620. But the wakeboard record is remarkable because it marks the sport’s rapid progression, from struggling to stand up against the force of the tow line to sticking 1260’s in only a few decades. And of course, there are the wakeboards themselves. What began as a surfboard with improvised footstraps has matured into a board sleek enough to cut through a powerful wake, and light enough to give the rider the temporary power of flight. Some riders have even gone back to the pre-footstrap style, rejecting bindings in favor of a “wakeskate” that allows for the board to be flipped and spun independent of the rider. As the sport has become increasingly technical, wakeboarding wetsuits and other specialized gear has also emerged. No matter what kind of board used, the fact remains: wakeboarding sprang from nowhere and now it is pushing the boundaries of strength and style in the water. Although wakeboarding began just a few decades ago, now riders clad in wakeboard wetsuits are pushing the limits of technicality and style. People these days are becoming more involved in the increasing growth of the sport of wakeboarding. With this growth comes choices of wakeboard companies to choose from especially when deciding which board you’re going to ride. Not only is it important to sport the best board and gear, it is equally important to look the part in your new wakeboarding clothes and wakeboarding gear. What better way to accomplish this than by checking out the perfect wakeboarding clothes, accessories and gear for your wakeboarding needs! So where does one find wakeboarding clothes, accessories and gear you ask? If you make a decision to look for clothes there are many companies that have high quality wakeboarding clothes made specifically for wakeboarders. Just make sure that before you head out on the water you ask yourself this question…”Do I look like a wakeboard pro today?” If the answer is no, then find those high quality wakeboarding clothes by shopping from the comfort of your own home through online wakeboarding stores. It’s easy, secure and convenient. The best part is your entire order will be shipped and arrives at your door. Remember, when shopping for yourself or someone special, giving wakeboarding clothes or gear is the perfect gift. Whether you’re wearing a wakeboarding visor or wakeboarding cap to block the summer’s sizzling rays, a rash guard to protect your skin from the discomfort of your life jacket, or just sitting on the shore making a statement in your wakeboarding t-shirt, you know you’ll look your best while drawing everyone’s attention. By shopping with ease through online wakeboarding stores looking like a pro wakeboarder has never been easier. See you on the water! One of the top manufacturers of wakeboards, the Hyperlite team consists of top, current and ex – professionals including Scott Byerly, Shaun Murray, JD Webb and Erik Ruck. Needless to say, Hyperlite Wakeboards offered to the public are great quality boards that are preferred by experts and novices alike. The Kids and the Girls series make Hyperlite different as compared to all other manufacturers. Very few manufacturers take the effort to provide boards specially designed for females. Kids are offered separate boards due to the height and weight factor. However, no manufacturer offers such quality boards with so many features designed specifically to help kids learn wake boarding. The Motive wakeboard offered in the Kids Unite Series is very affordable and is designed solely to enable kids to learn this sport. This board is perfect for children who are participating in wakeboarding for the first time. State 125 takes the participant to the next level with a three stage rocker. This board is perfect for those who have tried wakeboarding and have liked the same. This board is best for those who want to become proficient at and those who want to learn more tricks. The appearance, patterns and colors used to paint the wakeboard play a major role in its ‘coolness’ quotient. Male enthusiasts often express themselves through loud colors and brash designs. However, the same is not true for women. They love those boards that help them connect with their feminine side in a predominantly male sport. That is the reason why Hyperlite wakeboards designed specifically for women come in bright vibrant colors like pink combined with white or black. These boards contain simple and minimalist patterns that look great when the individual is performing wakeboarding stunts. Women centric wakeboards are available for beginners, intermediate stage participants and experts. 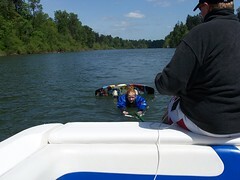 The basic board is perfect for those who are participating in wakeboarding for the first time. The intermediate boards introduces the female participant to three stage rockers and is designed to accommodate the balancing errors that often take place when the individual performs tricks and stunts for the first time. Hyperlite for women experts are no different from those for male experts as far as quality and design of the boards are concerned. The boards for experts include molded fins, cupped rails and thinner profile. All this enables the wake boarding enthusiast to participate and compete with the best without having to worry about the wakeboard. You can opt for the standard Hyperlite wake boards for beginners and experts if you are not keen on feminine designs. All Hyperlite wakeboards are great quality boards designed to last for a long time and provide great value for money. Byerly Wakeb oards is a brand that is unique in the world of wake boarding. The folks involved in the designing and manufacturing of the boards are one of the most well known personalities in the world of water sports. Hence, it is not surprising that Byerly Wake boards are so popular. Who else can give you such high quality wake boards than the very individual who popularized wake boarding? What are the special features of Wake boards? The wake board is very light, very strong and the best in terms of maneuverability. The entire range of Wake boards forms the lightest wake boards in the market. You can be rest assured that your Wake board will get you off the wake like a shot. The most innovative feature used in these wake boards is the use of Glass Rope Edge Technology. The makers have fitted .25″ fiberglass edge to each and every board in its range. What does this do? This reinforces the weakest part of the board which is liable to maximum damage and wear and tear. The use of compression molding and glass technology gives a lot of strength to Byerly Wake boards. Further, it enables the makers to reduce the thickness of the board to unimaginable levels without compromising one bit on technology. This is the reason why Byerly Wake boards are the thinnest boards around. This leads to less weight, more control and very high maneuverability for the wake boarding enthusiast. What makes Boards stand out? Their mind blowing designs of course. Apart from the quality of the board, the appearance and the design sets it apart from all other manufacturers. The use of colors, patterns and designs will definitely evoke jealously and awe amongst all other participants. Further, the boards will look absolutely great while performing tricks and stunts. These boards have a three stage rocker that is designed to quickly revert back to its original position without any delay. This ensures that the board is back to its original shape the moment you finish your maneuver. This makes it very easy to time your release and your pop. Further, the light weight of the board will help you remain in the air longer and will help you perform multiple stunts and tricks without any difficulty. The use of high level technology and superior craftsmanship ensures that these boards last for a long time. Every cent you invest in these boards is worth it as you shall enjoy returns over a long period of time. Unlike other boards, these boards have molded foot bed contours designed to enable the individual to maintain complete balance at all times. The tip and the tail of these boards are purposefully made lean to provide maximum flexibility to the rider. This product is designed to be a lot stronger than the traditional foam core boards. The best thing about wake boards is that these can be purchased over the internet as well. You can check out the photographs and make your choice online. As long as you choose original boards, there shall be no quality or performance problems. Water sports are loved by many people. Wakeboarding is one of the water sports in which a person rides a wakeboard over the surface of water. People who practice this activity say that it’s a combination of the techniques that are used while doing snowboarding, surfing and water skiing. This water sport is performed with the help of wakeboard boats. These kinds of boats are specifically designed to do this task. They comprise of an inboard boat which has an engine placed at the back of it. This is purposely done as the weight of the engine makes the wake larger; however, some models have the engine situated in the middle section. Nowadays, one can find accessories for his wakeboard boat from an online store. Items such as towers, racks, ballast, mirrors, etc. can be purchased from such a store. Those looking for best wakeboard tower speakers, can search on the Internet and find out a dealer or firm that has a website showcasing a huge collection of all types of speakers and other accessories. While purchasing speakers, one must check the available items on the site. One can find boat tower speakers and related components namely woofers, connecters, cans, wires and amplifiers in all price ranges. Some people like to go for entry level speakers, which can be heard when they are hanging on the boat and some prefer devices that produce loud sound, which is audible even at a distance of 80 feet behind the boat. In order to save money one can buy marine speakers and speaker cans separately. Depending on the budget and usage of the speakers, one should decide the kind of speaker system that suits his needs. Other than this, tower mirrors are also an important part of wakeboard boat accessories. People prefer mirrors that are polished, adjustable and can be quickly released from the tower. LED lights can give a different and attractive look to the boats. If somebody is thinking of partying, then these LED lights that come in various colors are a great option. Decorating the wake-board with unique graphic designs sounds like a great idea! An on-line store does this job as well. In this way, water sports lovers can add a lot more in their collection of wakeboard accessories and suggest their friends the easy ways to get them. All they need to do is, go to the website, select the item and buy it by making on-line payments. ‘ONLY INBOARDS’ offers best wakeboard tower speakers, mirrors, racks and other wakeboard boat accessories to its customers. It stocks articles from companies such as Samson Sports, New Dimension, Big Air, etc. Check out the behind the scenes video of the 2015 Miss Wakeboarding shoot with Lissa De Lorenzo! Our staff photographer Bill Doster caught up with Lissa right after you, the viewers, voted her as the brand new 2015 Miss Wakeboarding! Stay tuned as she’ll be here representing Wakeboarding in the months to come! A big thanks to Supra Boats and Wet Sounds for their support of Miss Wakeboarding! Enjoy.